We are pleased to announce the Goodbye Flat Biology 2018 conference in September. 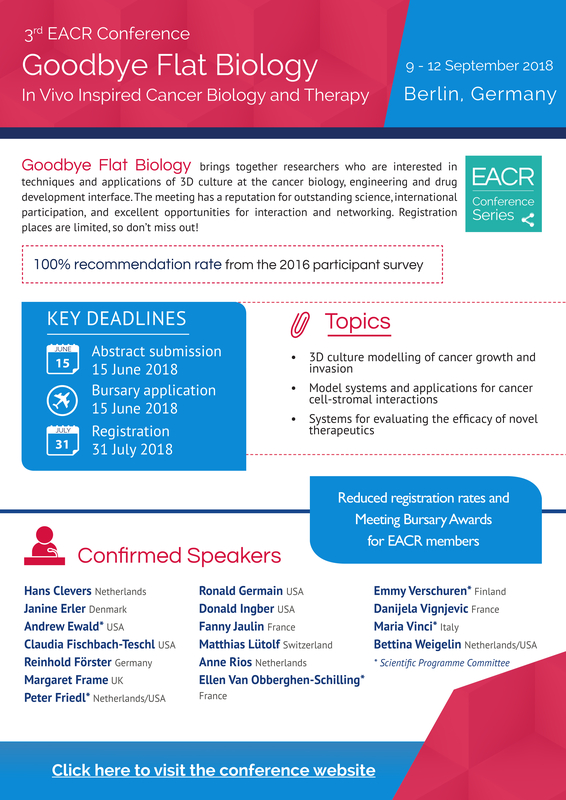 This is the 3rd Edition of a conference that brings together researchers who are interested in the techniques and applications of 3D culture at the cancer biology, engineering and drug development interface. There will be lots of exciting science with two exceptional bookends, an opening keynote by Hans Clevers (https://www.hubrecht.eu/onderzoekers/clevers-group/) and a closing keynote by Don Ingber (https://wyss.harvard.edu/team/executive-team/donald-ingber/). This meeting has a reputation for outstanding science, international participation, and excellent opportunities for interaction and networking. Registration places are limited, so don’t miss out!